Senior Diontae Johnson (3) catches a pass from quarterback Devin Black. Jacob Council photos. 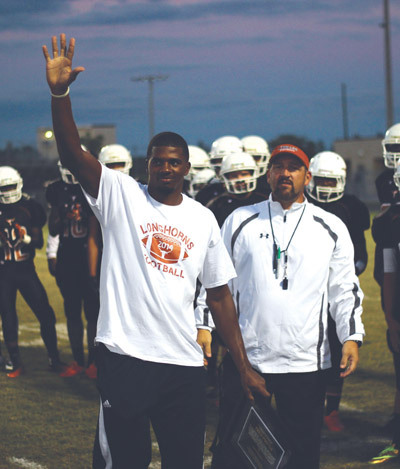 Resilient is the word of the week in the Lennard Longhorns locker room. A week after a difficult 56-0 loss to Armwood, one of the top teams in the state, it would have been easy for the young Longhorns to fade and rest on the laurels of what has already been the best season in their school’s history. But this team, and its coaching staff, would not allow that to happen. Instead Lennard bounced back, handing out their own blanking to Leto, 49-0. Perhaps a mark of how far the team has come this season and the standards they have set, their coach was not entirely pleased with the team’s performance. The loss to Armwood was tough to take, especially for a group of young players, Chattin said. “They are 16-, 17- and 18-year-old kids, so sometimes it takes the next Friday to put it behind you. The Longhorns are now 7-2, the best record, by far, in school history. “That’s something for the kids to be proud of,” said Chattin. Fred Porter, above left, was honored at the Lennard-Leto game last Friday. He is the first Lennard High School graduate to play for a Division 1 college. Porter is a wide receiver at Florida International University in Miami. He played youth football for the Progress Village Panthers and the East Bay Buccaneers. 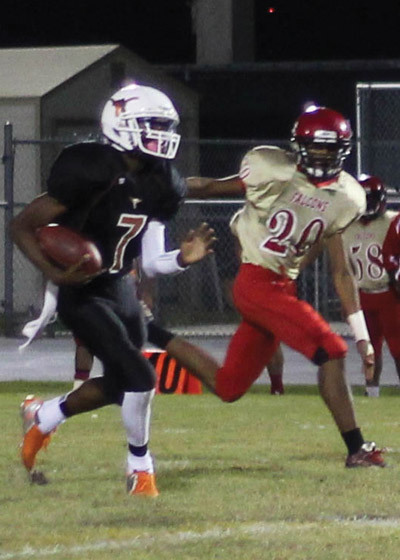 With Hillsborough holding the tie-breaking win over Lennard, the playoffs are now beyond the Longhorns. 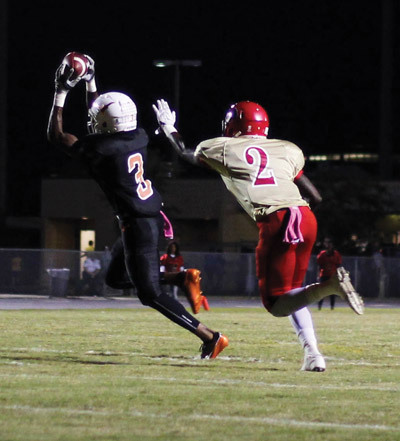 Lennard’s last game of the season will be Spoto at home. “I still think we are a playoff-caliber football team, but the way that things are decided we will be sitting at home for the playoffs,” Chattin said. Perhaps once they can sit at home and let their record-breaking season sink in, the players will realize what a remarkable turnaround they have had this season. The end of the season may be in sight for the Longhorns but their achievements may still be recognized at post-season award ceremonies. Stay tuned. Riverview went down 35-28 against Alonso. Turnovers early in the game cost the Sharks, said Riverview coach Mike Thornton. Next up for the Sharks is a game against rival Newsome. East Bay, who had their playoff destiny in their hands, suffered a tight 28-17 loss to Brandon.